(South Rupununi, Guyana, Sept. 21, 2018) Marutu Taawa (Marudi Mountain) sits deep in Wapichan territory in the South Rupununi, Guyana, and holds historical, cultural, spiritual, and biological significance for us. The stories that we Wapichan know of Marutu Taawa, however, are not ones we usually hear in the news. Instead, we hear news about the amount of gold being discovered at Marudi by the Canadian mining company Guyana Goldstrike, which operates through its local subsidiary, Romanex Guyana. In July, Goldstrike and Romanex published a draft Environmental and Social Impact Assessment, seeking an environmental authorization from the Guyana Environmental Protection Agency (EPA) to begin large-scale operations on the mountain. The South Rupununi District Council (SRDC), a legal representative institution for the Wapichan people, recently submitted official comments and objections to this ESIA, requesting that such an environmental permit be denied because of grave defects in the ESIA process and report. Marutu Taawa is sacred to us, and is a place where we hunt, fish, and gather, and where our rivers are born. The mountain sits at a critical watershed, and its creeks flow into important rivers – the Kwitaro, Kuyuwini, Rupununi, and Essequibo, important lifelines for our communities. As one of our elders and knowledge holders, Nicholas Ernest Myers, says, “All those mountains and forests down towards Marutu Taawa ‘Darkness Mountain’ are important to us Wapichan nao, and our foreparents cared for the area… It is also a very rich area for important resources used by the Wapichan nao… The area is so important as all of the creeks coming from the Marudi area are feeding different streams and rivers. It is a special watershed in our territory…” With this proposed large-scale mine, we foresee major negative impacts on our culture and way of life and the environment. This is of grave concern to us, and should be to all Guyanese, and most of our concerns are not adequately addressed in the ESIA. ESIAs are supposed to provide the government and affected communities with information about the potential impacts of a project before the project is approved. International courts have mandated, and international standards and guides recommend, that indigenous peoples effectively participate throughout the ESIA process. Such involvement would ensure that the affected indigenous people can fully understand the impact analysis presented in the resulting ESIA report, and that their concerns will be addressed. In Guyana, the Environmental Protection Act requires that any interested bodies or organizations be consulted. Because we are the main rights holder in this process and we were never consulted, we submitted formal objections to the draft ESIA in accordance with the Environmental Protection Act. The draft ESIA was published without any consultation or discussion with the SRDC. In fact, numerous requests for meaningful input into the process were ignored. 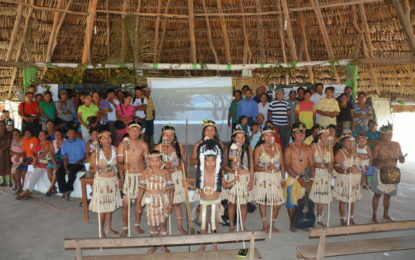 The few meetings that were held were inadequate because of insufficient notice prior to the meeting; lack of explanation as to the purpose of the meeting; failure to provide information about the ESIA process; failure to provide accessible and accurate information about the proposed mining process and its impacts; lack of translation; failure to receive input from our community members on how the meetings should run; and lack of follow-up from the meeting. This violates our rights to effective participation in decision-making affecting our way of life, and as relevant, in ESIA processes. It also falls short of international best practices. The Area of Influence described in the draft ESIA is too limited – all of our Wapichan villages, not to mention, much of the rest of the country, will be influenced by this project. Marudi Mountain is not only historically, culturally and spiritually important to us, many of our villages utilize the rivers sourced from there on a daily basis. Some parts of the draft ESIA are outdated and include data gathered from up to three decades ago, there are gaps and inconsistencies in the data, and the report contains serious inaccuracies about our cultures, beliefs, and traditions. These deficits lead us to have serious concerns about the quality of the report as a whole. The scientific assessment includes sections that are underdeveloped or contradict earlier documents and/or the company website. For example, although the draft ESIA purports to address impacts on groundwater, it only considers surface water and shallow subsurface flow. Other areas of particular scientific concern are: the type of mining, the nature of the mineralization (especially in regards to acid mine drainage), and understanding of local and regional hydrology. Given the flawed ESIA process and the defects in this draft ESIA itself, the SRDC strongly encourages the EPA to deny Romanex an environmental permit at this point. We expect that in a revised ESIA process, Ground Structures and Romanex will respect our rights, utilize up-to-date information, apply international best practices and will fully and effectively involve us. We ask that Guyana Goldstrike [TSXV-GYA] take responsibility for overseeing the actions of its subsidiary and ensure that it respects indigenous rights; we also request that the EPA oversee a process that ensures the consultant and the mining company are adhering to the law and international best practices relating to our rights. The conversation about Marudi has been solely focused on the gold for too long. We will not continue to be left out of the conversation. We know, use, and respect Marutu Taawa, and we cannot allow decisions to be made about what happens there without us.